E1 41 Non smoking/ Must be 25+ to book/No pets The public beach access is only steps from your front door. A short walk will lead you to the center of the island where you can enjoy a game of miniature golf, homemade ice cream, dinner and more. Relax in the rockers on the front deck and embrace the sights and sounds of the Atlantic from across the street. Create memories that will last a lifetime when you make this home your ?home away from home?. Bring a grill and enjoy quality time with the family dining outside at the picnic table. With 4 bedrooms and 2 baths, this home accommodates 13. The first floor consists of the living room, dining room and kitchen area, along with 2 bedrooms and one bathroom. 1Queen and 1Single (oceanside) and 2Doubles (streetside). Two bedrooms are located upstairs and also share a bath in the hall. 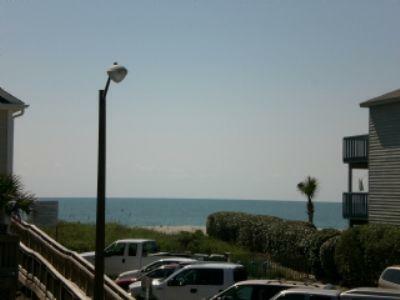 1Double (oceanside) with private ocean facing balcony, 1Double and 1Single (streetside), 1Double futon available. Amenities include color cable TV's, DVD, washer & dryer, microwave, dishwasher, central heat & air and an outdoor shower. NO smoking, NO pets.